People of the Book Club is for women who like to read and talk about ideas. We focus on books with some Jewish content and/or whose author is Jewish. Fiction or non-fiction, older books or contemporary ones, even some combination of shorter works (for example, essays, short stories, journalism) — all are chosen to spur serious discussion of the works’ literary qualities (if fiction), and about their Jewish themes, social issues, moral and ethical controversies, and the like. 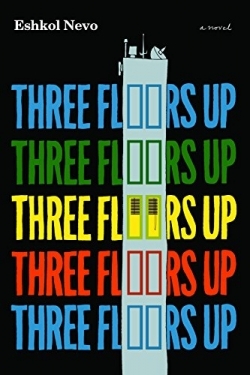 American Jewish World says Three Floors Up is “Written simply but imaginatively, translated fluidly by Sondra Silverston. Each story is an evening’s reading because you won’t want to stop.” But an unnamed reviewer warned: “Although each section can be read independently, it is anything but a loose collection of stories. . . . Readers will need to read the novel in its entirety to fully appreciate the gradual build-up of unease, while the ending provides a solution for some, but not for all." Eshkol Nevo was born in Jerusalem in 1971. His six novels have won many awards and have been translated into Italian, German, French, Spanish, Romanian, Polish, Serbian, Ukrainian, Arabic, Turkish, and English. In 2008, Eshkol was awarded membership in the Israel Cultural Excellence Foundation, one of the country's highest recognitions for excellence in the arts. He is the grandson of Israeli Prime Minister Levi Eshkol, for whom he was named. He has taught creative writing and thinking at the Bezalel Academy of Art and Design, Tel Aviv University, Sapir College and the Open University of Israel. He is considered the mentor of many upcoming young Israeli writers. We hope you'll be intrigued and will join us. RSVP to Judith Davidoff, jmdavidoff@bellsouth.net, 305.665.0012.